I don’t know if words can describe how beautiful Emerald Lake Lodge is when it’s buried under a thick blanket of snow like it was for Stephanie & Jesse’s Emerald Lake winter wedding. The snow was at least 3 feet high and I actually had to dig out a trench for myself to stand in to even be able to photograph their ceremony because there was just so much snow everywhere! Their wedding truly was set in a winter wonderland! Following their ceremony we wandered the area around Emerald Lake for photos, which was an expressive feat in itself… seeing that Stephanie was walking on a fractured ankle! That’s right! She was walking on an air boot in all of that snow! Just shows how awesome she is! We lasted out in the cold for quite some time and I’m in love with how their photos turned out for their Emerald Lake winter wedding. If you’re thinking of planning a winter wedding, you truly need to consider Emerald Lake Lodge! 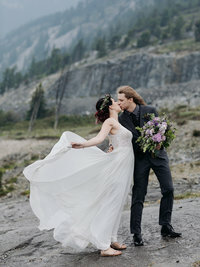 Here’s some of my favourite photos from Stephanie & Jesse’s fabulous Emerald Lake winter wedding that was coordinated by Something New Weddings (the amazing mountain wedding planner)! Are you planning to get married? Are you looking for an Emerald Lake winter wedding Photographer? ENV Photography would love to be the one to capture your intimate wedding or elopement in the Rocky Mountains! Please get in touch for more information on weddings & elopements in Canmore, Banff, Lake Louise and other mountain destinations. If you aren’t in the market for an Emerald Lake winter wedding photographer, ENV Photography also photographs maternity, kids & families! Looking for more winter weddings and elopements? 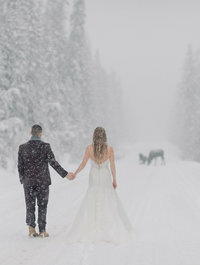 Check out this winter elopement in Lake Louise! 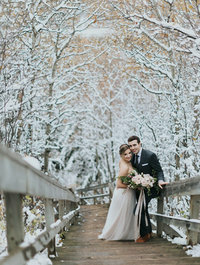 Check out this winter elopement in Banff! 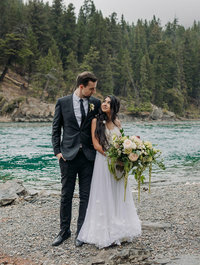 And this winter Emerald Lake Elopement!